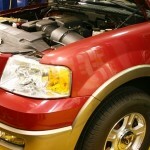 Ford Expedition lean codes could caused by a leaky PCV hose. If a car has a check engine light on and has P0171 and P0174 codes stored, the most likely cause is a vacuum leak. These codes are set by the car’s computer when it sees too much oxygen in the exhaust. Excessive oxygen readings in the exhaust will set lean codes. This does not mean that the oxygen sensors are defective. It is a common mistake for people to replace oxygen sensors when lean codes are present. Just because the code is related to oxygen sensor readings, it doesn’t mean that the oxygen sensors are bad. If both of these codes are stored this means that both banks of the engine have excessive oxygen in the exhaust. If the oxygen sensors are replaced it’s most likely that the same codes will reappear. It is very uncommon for two oxygen sensors to fail at the same time. Therefore the most likely cause of P0171 and P0174 codes is a vacuum leak. The source of a vacuum leak can be one of many things. The most common cause of a vacuum leak is a leaky hose. Vacuum hoses over time can become dry and brittle. The rubber deteriorates and can leak causing a vacuum loss. Many times a leaky vacuum hose can be found by listening for a hissing sound. 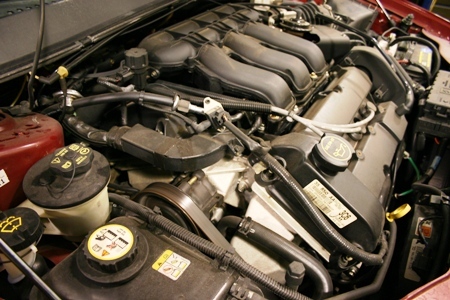 A large vacuum leak can even make the car run rough at idle. In some cases it will not idle without feathering the gas pedal. Another way to check for a vacuum leak is by using a propane bottle with the hose attachment. By introducing propane to the area where the suspected leak is you can sometimes notice a change in the idle. This is particularly true with cars that don’t have computers. Cars that have computers can quickly compensate for the change in fuel mixture. This makes checking for vacuum leaks in this manner more difficult. If you have access to a scan tool, checking the oxygen sensor readings or fuel trim can be done while checking for leaks with propane. If the readings increase when you are adding propane to be suspected leak area, this indicates a vacuum leak. Another way to check for vacuum leaks is with a smoke machine. 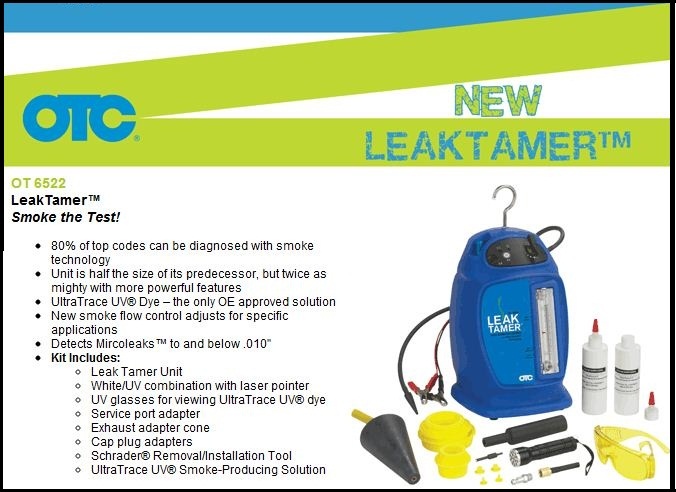 Evaporative smoke testers can be used to check for vacuum leaks as well. 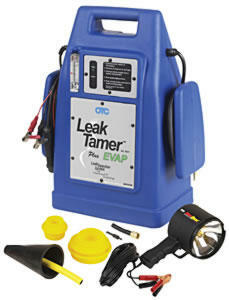 Evaporative leaks have to do with fuel vapors and a smoke machine is used to find those leaks. But evaporative smoke machines can also be used to find engine vacuum leaks easily. To check for engine vacuum leaks with a smoke machine, just find a vacuum hose that goes to the engine and attach the hose on the machine. When the smoke machine is turned on, smoke will enter the engine and help reveal the vacuum leak source. It is common for some smoke to come out out certain areas without indicating a vacuum leak, so if you think you’ve found a leak with the smoke is best to double-check it to make sure. The smoke machine is a great time-saver and can help pinpoint vacuum leaks quickly. Mass Air Flow (MAF)Another cause of P0171 and P0174 codes can be from a damaged mass airflow sensor. If the reading from the mass airflow is incorrect, the computer can be doing its calculations with wrong numbers. The computer bases the fuel mixture partially based on the amount of incoming air. If the computer sees more air entering the engine than what is actually going in it will enrich the mixture. Therefore if the computer sees less air than what is actually going into the engine it will decrease the amount of fuel in the mixture. Mass airflow sensors can be damaged by dirt getting past the air filter and sometimes from oil that can come off of aftermarket air filters such as K&N. K&N air filters have to be lightly oiled and if excessive oil is applied some of it can come off and end up in the mass airflow sensor. If oil contaminates the sensor it can cause skewed readings. Fuel Pressure Incorrect fuel pressure from the fuel pump can also rarely cause a lean condition. The fuel pump regulator could be allowing the wrong amount of pressure to be pumped to the fuel injectors. If a fuel filter is clogged or restricted this can alter the amount of fuel that reaches the injectors also. Fuel pressure is not likely to cause lean conditions though, due to the computer’s ability quickly compensate and adjust the air fuel mixture. 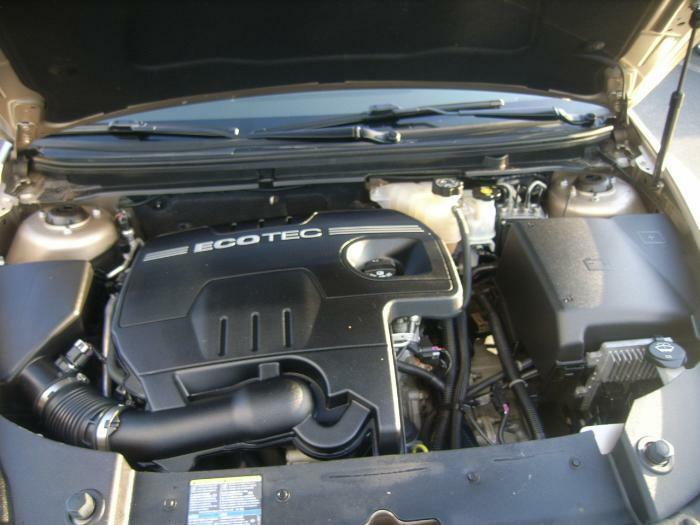 We recently had a check engine light come on and after having it scanned at a local parts store we replaced an oxygen sensor. The parts store employee had recommended the oxygen sensor replacement however the code quickly returned. After going back to the parts store they recommended a fuel filter. After buying a fuel filter and going home my husband was about to install it when I searched online and found your article. After explaining to my husband that the cause could be from a leaky vacuum hose, he ran the car with the hood up and we could hear hissing. The problem was exactly what you said, an inexpensive rubber hose. Thanks so much for sharing this auto repair tip. Although the parts store employee was trying to be helpful he was recommending replacing parts that were not bad. I don’t think he was doing this intentionally, but it was starting to cost us an arm and a leg! Thanks again for all your help. 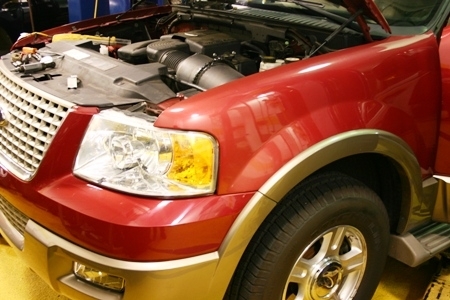 Here’s our experience, my wife’s 2003 Ford Expedition was stalling out while driving slowly and at stop lights, etc… We took it to an Advanced Auto parts store and they scanned it with a code reader and said it was the bad coil and spark plug. We changed them but did not get any better. We thought maybe we had a defective part, so they exchanged them and we installed the parts again to no avail, it was still stalling. We took it in again yesterday the parts store said it was the fuel filter. We took the car to the Ford garage and had that changed, but it was still not running right. They did a diagnostic test and came up with the PO171 and PO174 codes again. I searched those codes on the Internet and found your site and read automotive repair blog. My wife read that there might be a leak in a vacuum hose. She reminded me that she had heard hissing noises over a week prior and had mentioned it then. I didn’t listen, forgot about it until she said again, “I told you I heard hissing sounds a while ago!” So I checked the hoses and found that there is a leak at an elbow in one of the hoses! No telling how long this would have gone on, but with your help we were able to repair the problem ourselves and not continue throwing money at the problem. Thanks for your help and I will recommend your site to everyone I know! Smoke test should reveal the leak. Good Luck. 2005 Crown Vic police int. The P0171 code pops up. There is a prominent hose on the fuel rail passenger side near front. The hose slides loosely an inch or so in or out (but does not pull loose). What is this hose and does it need replacing? I’d check for vacuum leaks. You may want to refer to a parts breakdown to identify the hose. Good Luck. I had already spent $16 for access to online Chilton manual that as it turns out does not include (viewable?) parts images and tells me to “Refer to the Powertrain Control/Emissions Diagnosis (PC/ED) manual” which it doesn’t include, for “Emissions Control” / diagnostics. Is there a decent source of reference so I don’t subscribe to another inadequate service? Hi, I have a 97 ranger with a 2.3. Had tps replaced and started getting lean codes but truck ran fine. Now it runs very rough at idle and a pending code for the evap system showed on the reader. I replaced the sensor in front of the charcoal box but it still ran rough. If I remove the vacuum line from the charcoal canister to the sensor the idle smooths out and the truck runs fine. Any ideas? Possibly a vent solenoid staying open all the time. Good Luck. out of nowhere my truck started missing followed with a check engine light. pulled codes p 0301 and p 0316. Changed the coil with no luck. I remembered hearing a squeal on initial start up and remember changing the camshaft synchronizer and fixing this problem before. pulled #1 plug and put a vac/psi reader to cylinder 1. turned the crank to the end of the compression stroke TDC. I couldn’t take one of the 5.5mm bolts out of the sensor so I assumed I could go ahead and pull the unit and put the new synchronizer on with the alignment tool and be fine. put everything together and started her up. runs with a miss-check engine- P0171 P0174???? I did a smoke test and can see a small amount leaking from the housing on the pcv. I am getting a new one today but my question is should it matter about pulling the old unit with the sensor on top if I was TDC and had a tool to put the new synchronizer on? Shouldn’t matter if it’s lined up correctly. Good Luck. Most likely vacuum leak. Could also be an exhaust leak. Good Luck.